Flour milling was considered a reputable occupation and the largely German milling community was esteemed among the city’s businessmen. Milwaukee’s central flour milling district was located along the Milwaukee River, just below the North Avenue dam, with the two largest mills situated along the west bank of the river near present-day Vliet Street. 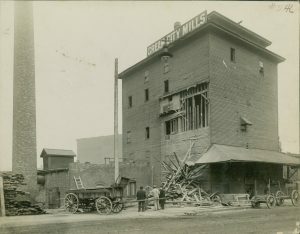 By the early 1890s, there were seven major mills operating in the city: Eagle, Phoenix, Daisy, Reliance, Jupiter, Duluth, and Gem. Other flour production centers in the state included Neenah-Menasha, Watertown, Janesville, Appleton, Oshkosh, Fond du Lac, and LaCrosse; however, none of these towns could offer access to national and international markets at competitive rates or produce on a scale that rivaled Milwaukee. 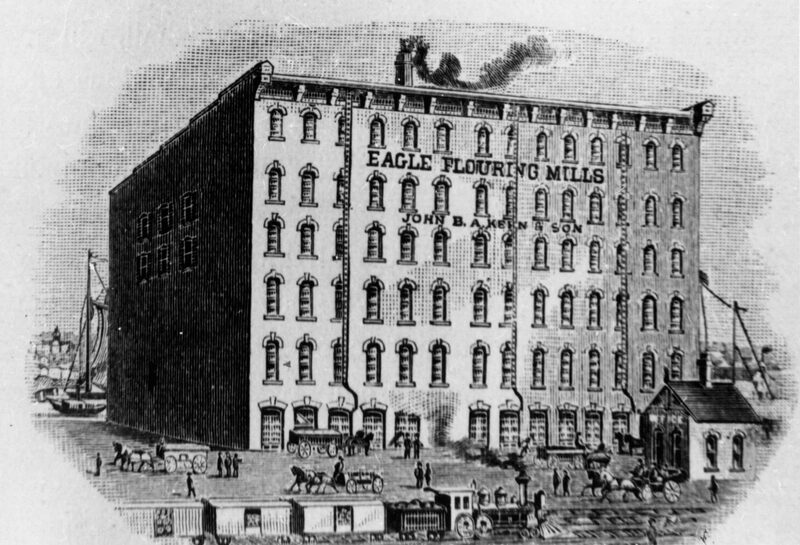 Although milling could be an unpredictable business, subject to weather and market fluctuations, Milwaukee’s flour industry grew in importance throughout the late nineteenth century. Annual output in 1854 stood at just 130,000 barrels, but by 1868 that number had risen to 625,000 barrels. A more efficient refining process introduced in the early 1870s, called “high milling,” led to a boom in Milwaukee production. Well-suited to the varieties of spring wheat grown in the Upper Midwest, high milling, coupled with the regional railroad network, gave Minneapolis and Milwaukee advantages over rivals such as St. Louis. By 1892 Milwaukee millers were putting out 2,117,009 barrels of flour per year, more than a fifty percent increase from 1889. Despite these gains, Milwaukee could never truly compete with the Twin Cities, especially as wheat farming moved farther west. Between 1910 and 1919, the centrality of milling in Milwaukee’s economy waned, with production declining from 1,318,565 barrels to 584,883 barrels per year. By 1919, the city was not even producing enough flour for local consumption, and within a year’s time, flour milling was no longer listed as one of Milwaukee’s top ten industries. ^ Bayrd Still, Milwaukee: History of a City (Madison, WI: The State Historical Society of Wisconsin, 1948), 63-64. ^ Frederick Merk, Economic History of Wisconsin during the Civil War Decade, Wisconsin Historical Studies, vol. 1 (Madison, WI: The State Historical Society of Wisconsin, 1916), 131-132; L. R. Hurd, “Milwaukee’s Flouring Industries,” in Milwaukee’s Great Industries: A Compilation of Facts Concerning Milwaukee’s Commercial and Manufacturing Enterprises, Its Trade and Commerce, and the Advantages It Offers to Manufacturers Seeking Desirable Locations for New or Established Industries, ed. W. J. Anderson and Julius Bleyer (Milwaukee: Association for the Advancement of Milwaukee, 1892), 149. ^ John Gurda, The Making of Milwaukee (Milwaukee: Milwaukee County Historical Society, 1999), 118, 125; Hurd, “Milwaukee’s Flouring Industries,” 151. ^ Charles N. Glaab and Lawrence H. Larsen, “Neenah-Menasha in the 1870s: The Development of Flour Milling and Papermaking,” Wisconsin Magazine of History 52, no. 1 (Autumn 1968): 22-25, accessed May 6, 2013. ^ Gurda, Making of Milwaukee, 118; Still, Milwaukee, 189; Robert C. Nesbit, The History of Wisconsin, Volume III: Urbanization & Industrialization, 1873-1893 (Madison, WI: State Historical Society of Wisconsin, 1985), 153-154. ^ Still, Milwaukee, 189, 328-329, 495. Hurd, L. R. “Milwaukee’s Flouring Industries.” In Milwaukee’s Great Industries: A Compilation of Facts Concerning Milwaukee’s Commercial and Manufacturing Enterprises, Its Trade and Commerce, and the Advantages It Offers to Manufacturers Seeking Desirable Locations for New or Established Industries, edited by W. J. Anderson and Julius Bleyer, 149-151. Milwaukee: Association for the Advancement of Milwaukee, 1892. Merk, Frederick. Economic History of Wisconsin during the Civil War Decade. Wisconsin Historical Studies, vol. 1. Madison, WI: The State Historical Society of Wisconsin, 1916.